We have here a collection of wearable tools for your EDC, camping, hiking, survival, outdoors and more. 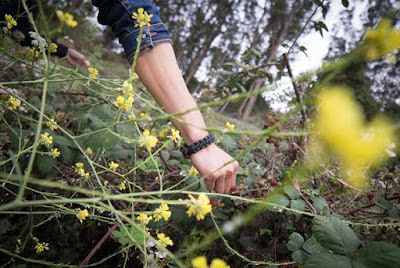 Most of these tools are wearable, and the rest can be kept in your pocket or on your gear. 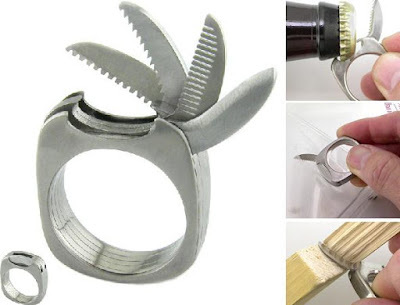 Titanium Utility Ring: This smart looking ring is crafted from aerospace grade titanium and comes with hidden useful tools. It cleverly hides a bottle opener, straight blade, serrated blade, comb and even a saw. The titanium plates are held together with brass rivets. The ring is handmade, made to order, one at a time and only one is available right now. Buy Now: $295. 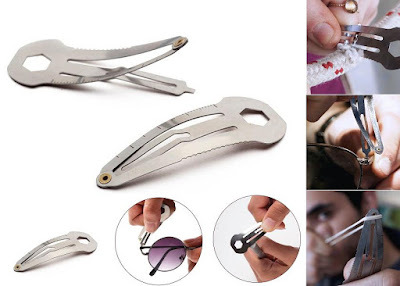 Hairclip Multi Tool: This multi functional hairclip doubles as a toolbox on the go; it comes with 5 different tools in a tiny hair clip. It features screwdrivers, a wrench, a trolley coin, a ruler, and a cutting edge. It's made of Stainless steel and measures 6cm x 2.4cm x 1.2cm. Buy Now: $9. EDC Prepper: The EDC Prepper is a wearable survival and tool kit that is always on you and comes equipped with firestarter, knife, light, whistle, signal mirror, tinder, needle, luminous compass, fish hook and line, paracord and more. Buy Now: $125. 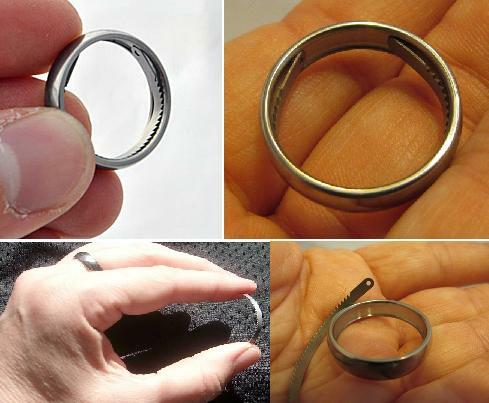 Titanium Escape Ring: The Titanium Escape Ring is a practical jewel that features a hidden escape tool. 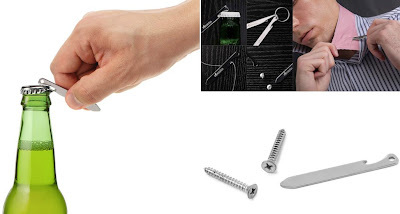 The stainless steel tool measures 2" x 1/8" x 1/64" and is very flexible and lets you easily cut rope, duct tape, zip-ties and more. 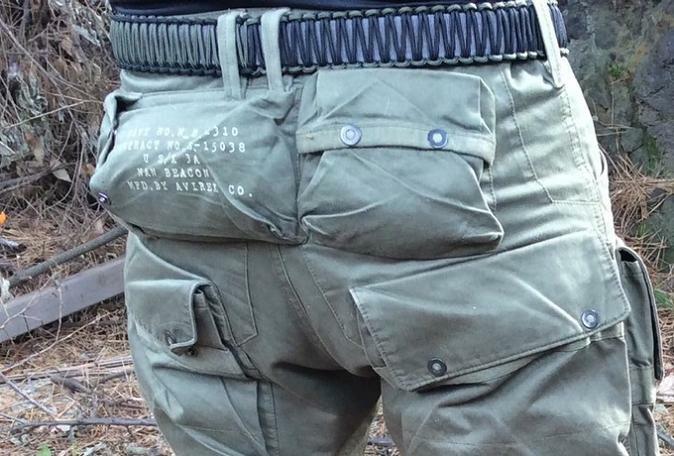 Buy Now: $69.95. 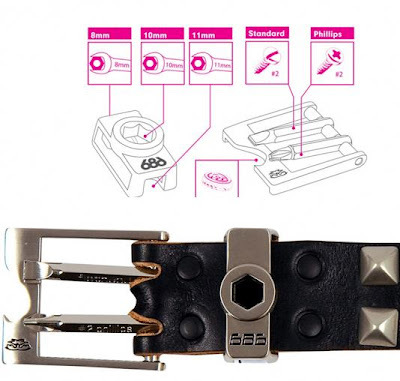 Multi Tool Belt: This belt includes driver bits, bottle opener and turns 8, 10 and 11mm hexagonalbolts. Buy Now: $36. 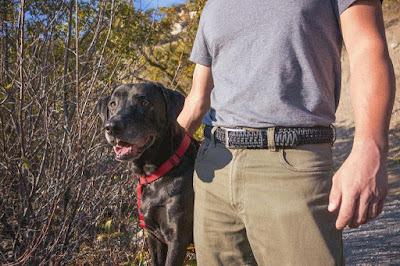 Survival Paracord Belt: The Rattlerstrap Paracord Survival Belt provides you 100 ft of paracord on you at all times and features a tough titanium buckle. Buy Now: $97 - $117. 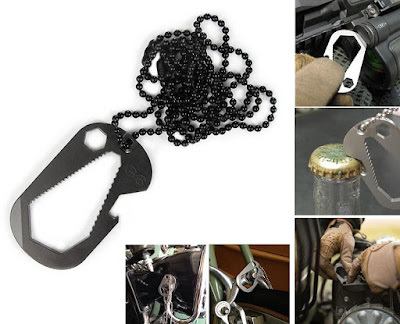 Dog Tag Tool: The Dog Tag Tool is made from titanium and stainless steel. 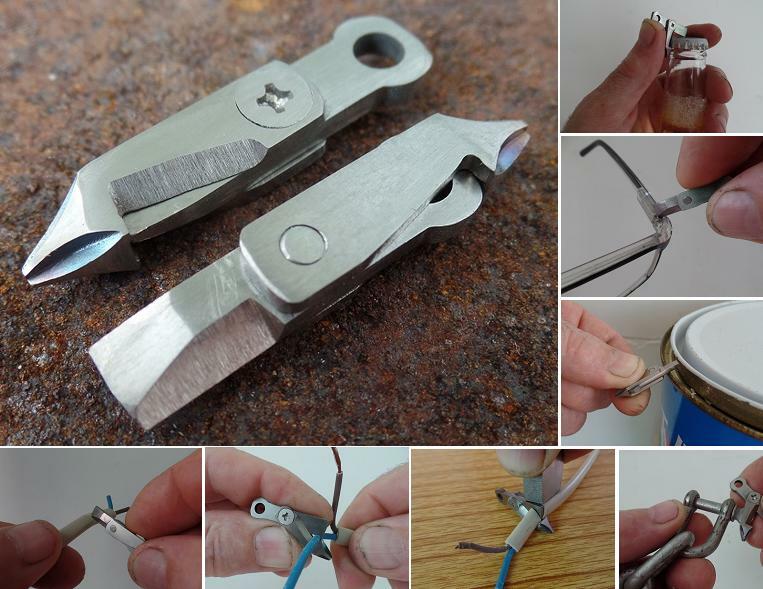 This multi-tool provides "universal" closed end wrench that works with both standard and metric hardware, a bottle opener, a quarter-inch bit driver, and a batterybay driver. Buy Now. Travel Adventure Belt: The Travel Adventure Belt provides you with up to 50ft of high tensile cord, Micro Survival Guidebook and Concealed Kit hidden inside to be used in a variety of situations. Buy Now: $69.99 - $ 99.99. 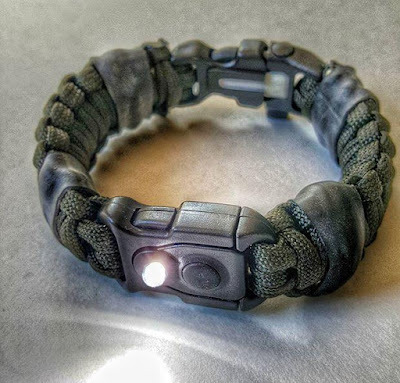 Survival Paracord Bracelet: The Survival Paracord Bracelet is a handy wearable device with 3 meters of paracord and a firestarter. Buy Now: $17. 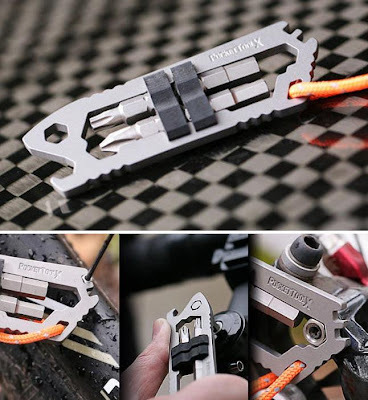 Titanium Collar Stay Multi-Tool: This featherweight titanium collar stay keeps your collar looking sharp and comes with screwdrivers, thread cutter, and bottle opener. Buy Now: $30. 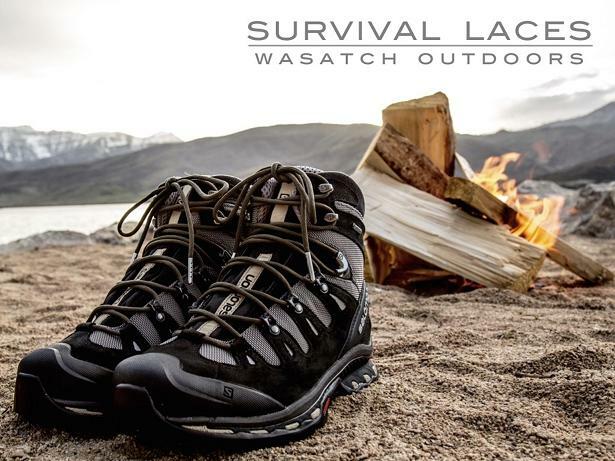 Survival Laces: Survival Laces are made with 550 paracord that works as firestarter, tinder, and fishing line embedded in paracord laces. Buy Now: $11.99 - $23.99. CRKT Guppie Multi-Tool: This cool handheld multi tool features an adjustable wrench, high carbon stainless steel blade, removable bit carrier secured with magnets (also equipped with a light), bit driver, multi-use pocket/money clip, and a carabiner that doubles as a bottle opener. Buy Now: $26.81. Little Bit More: The Metperial Titanium Little Bit More is made from grade 5 titanium. This multi tool is extremely lightweight, can be worn as jewelry and functions as a small knife, lever, screwdriver, nail clipper, wirestripper, bottle opener, shacklepin wrench, scraper, and more. More info. Mako Bike Multi-Tool: It weighs in at just 19g, constructed from 6AL-4V (Grade 5) aerospace titanium, designed to be a cyclists perfect multi-tool. Buy Now: $40. 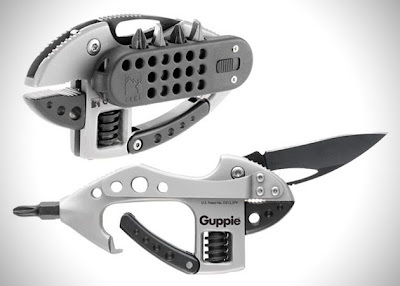 30 Must Have Foldable Camping Gadgets. 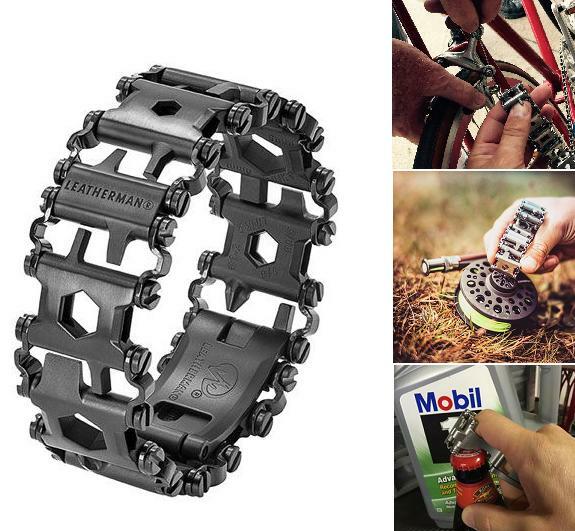 15 Best Gadget Cable Organizers and Holders. 15 Must Have Travel Gadgets for Tech Savvy Moms.